Child support arrears are a serious problem nationally and of particular significance in Colorado. Nationally, it appears that about half of all open child support enforcement cases have arrears. In Colorado, the figure is closer to 72 percent.1 Similarly, national child support figures show that in FY 1998, approximately 8 percent of all the child support orders established were only for TANF arrears and/or Foster Care arrears. In Colorado, the comparable figure was 25 percent. Nationally, the average prior year support due was $2,263 per case, compared to $4,400 in Colorado. The FY 1997 collection rate on current year support in Colorado was 47.8 percent, as compared with 5.5 percent for prior year support. 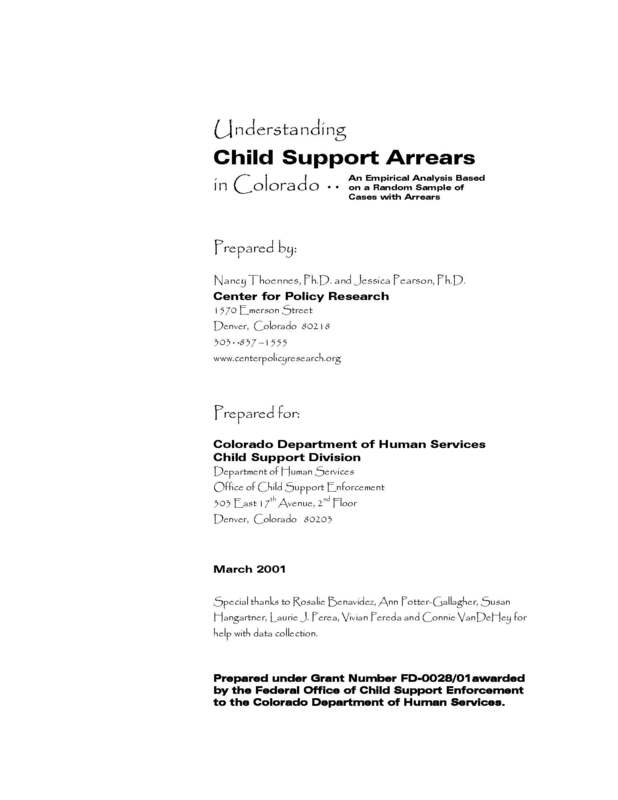 A variety of factors lead to a greater than average problem with child support arrears in Colorado. For example, Colorado calculates retroactive support back to the child’s birth, while most states use later dates, such as the date of filing for child support services or the date the order was established. Colorado has a mandatory minimum order and may also impute income to a noncustodial parent if actual earnings are unknown. There have been numerous calls for a reevaluation of policies and procedures for establishing child support and dealing with arrears, especially for low-income noncustodial parents. A number of qualitative studies suggest that current policies leave these parents frustrated and discouraged. The Federal Office of the Inspector General has called on states, with the assistance of the Office of Child Support Enforcement, to test how negotiating the amount of debt might be used to improve payment, the effects of different amounts of retroactive support on voluntary compliance, alternative methods of determining income to avoid the need for imputation, and how to encourage links between child support and job service programs. Before designing methods of testing these issues or redesigning policy and procedures, Colorado decided to collect information about child support arrears in the state. With a better understanding of what is owed and how the money accrued, the state could determine the most promising approaches for managing current, and preventing future, arrears. This report describes the results of this empirical study. It provides a description of the number and types of arrears cases in the state, and profile of the non-custodial and custodial parents in these cases.